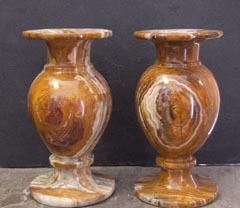 Powerful bursts of color well up from some unknown source and burst forth in the surface of the elegant marble vases. These colors are followed by waves of contrasting tone, which well up over and over again, compounding and confouncing the surface of the piece until the entire array is almost to much to stand. That is the power of onyx stone, one of the most passionate natural materials that can be found anywhere in the world. This whole process is intensified by the knowledge that your piece is a one of a kind, and those patterns of color will never show up in another avse in exactly the sam,e way. In this way your onyx vase almost has its own distinct personality, which will add depth to the decorative nature of the room in which it is placed. 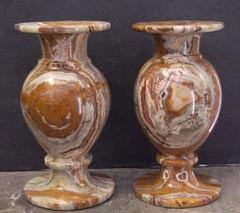 This tiny onyx bud vase is a testament to the perfect union of human craft and natural passion. The vase itself is flawless, with the shimmering perfection of its polished surface sloping gently into curves that trail throughout the pieces design. Yet beneath this glistening sheen there is a chaotic war. A clash of contrast played out ion erratic and beautiful colors, which swirl and mix and meld across the surface of the piece. One of a kind, the almost lifelike quality of the marble is the perfect compliemnt to a single flower, the epitome of life itself. Together they will contrast and collude to create a spectacle that is sure to draw attention, despite its humble sizing.